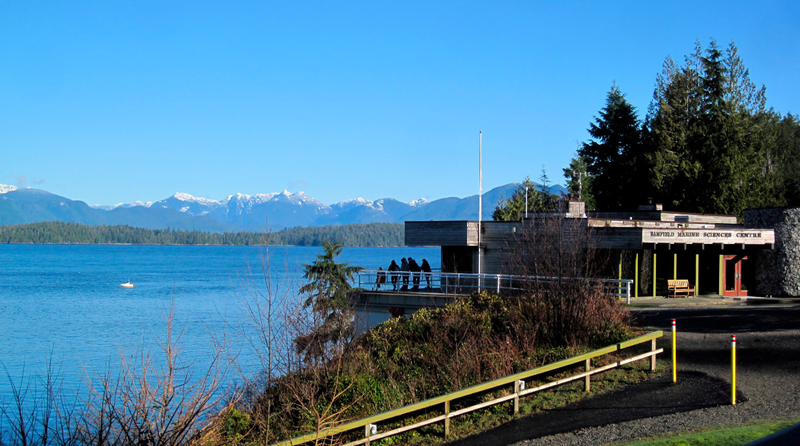 A beautiful Sunday in Bamfield (photo credit: Gillian Walker). R. Attending a future R bootcamp at BMSC is highly recommended to anyone who wants to start learning the R language, or increase their understanding of it! Figure 1. 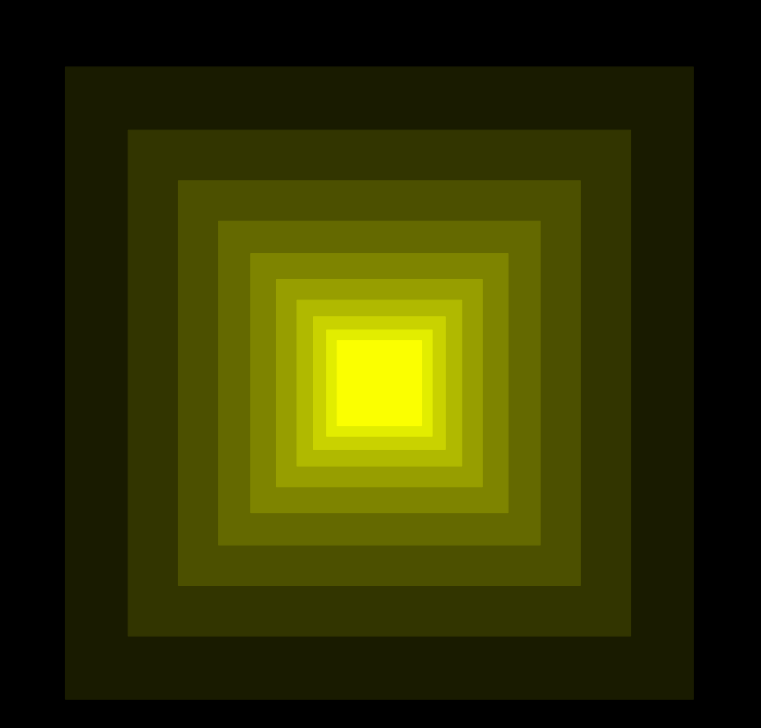 A figure produced using grid library view ports. In a typical introductory statistics course, you’re given some assumptions, and provided with formulas for churning out p-values and confidence intervals. But statistics might be left feeling rather like a black box: we’re turning input into output, but it might seem difficult to keep track of how all those assumptions and formulas work (or don’t). One of the simplest stats tests that you’ll see in a first statistics course is the one sample t-test for testing the null hypothesis that the population mean for a random variable with a normal distribution is equal to zero. 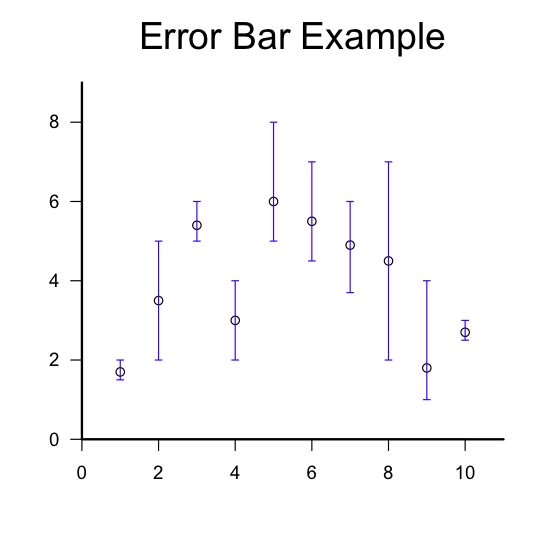 To implement this test in R all you need is the t.test( ) function. But what are the inner workings? The R script given below generates a pseudorandom sample and then puts it through the standard R function for a t.test, as well as a user defined version that should give you just about the same p-value. But wait… inside the t-test “box” other mysteries are to be found. For example: Where did the t-distribution come from in the first place? How should you interpret that p-value? And what’s up with that null hypothesis anyways? Sometimes asking questions leads to more questions… . You can run the script provided below by cutting and pasting it onto the R command line, and pressing <enter>. #a one sample t test against the null hypothesis that the population mean is zero. Statistical correlation may or may not be an easy concept to grasp. A typical stats textbook might show you clouds of data points, attach numbers to them, and suggest that you should try to get the general idea; it’s either that or work through the algebra. You can also resort to wordy explanations such as this: If X and Y are positively correlated, X will tend to increase when Y increases, and vice versa. Note that this last statement sounds a lot like a definition based on probabilities. Wouldn’t it be nice if a statistical correlation coefficient had a simple probabilistic interpretation? Such a coefficient exists. It’s called the Kendall Tau Rank Correlation Coefficient. Figure 1. 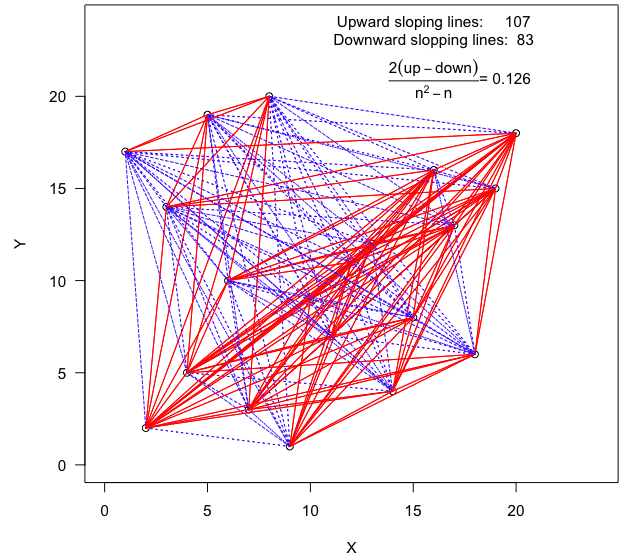 Lines with a positive slope are indicated in red; lines with a negative slope are indicated in blue. The Kendall Tau Rank Correlation Coefficient can be computed from the number of upward sloping versus downward sloping lines, as indicated by the equation in the figure. A figure like this one can be produced using the R Script given below (the long version). Dividing the number of line segments with positive slope in Figure 1 by the total number of line segments would yield a number between 0 and 1; this proportion can be interpreted as the probability that a randomly selected line segment will have positive slope. Re-scaling this proportion, with the equation given in Figure 1, yields a number between -1 and 1 that is the correlation coefficient tau. #settings for this webpage seem to not allow. Thus the convoluted code that follows. #In R, names(kendall) will be interpreted as “kendall” with straight quotes. kendall = numeric(0); kendall = as.data.frame(kendall); #To avoid quotation marks. #written by Allan Roberts, Feb 2013.